Ideal crane where a permanent crane installation is not an option or where the building structure will not support jib and overhead cranes. Great under-beam heights starting at 20'. Spans run up to 40', with clear spans up to 35' and load capacities up to 15 tons. With spans up to 40 ft. and capacities up to 10 tons, these fixed height steel cranes are perfect for maintenance shops, heavy lifting, and transfer operations. Under beam heights up to 16 ft. Excellent way to move materials through fabrication and assembly. Build flexibility into your operations with these adjustable height steel gantry cranes with capacities up to 10 tons and spans up to 40 feet. Be able to lift and transfer machinery components, engines and large fabrication pieces all with one crane. Easy to transport, lightweight and adjustable with capacities up to 3 tons and a maximum of 12 feet in height. Quick to assemble and disassemble, take these cranes on-site for construction work, facility modifications, or remote lift and load work. Economical and sturdy, these fixed height gantry cranes offer heavy duty steel support for light to moderate loads. A 5 ton capacity and maximum 12 foot span means you can move plenty of projects with this affordable crane. Extremely flexible in configuration and use, has 3-way adjustment, offers up to 10 tons of capacity and a truly stable A-frame design. Can be assembled in either full beam or cantilever configuration. Has adjustable height, span, and tread width. Steel with aluminum I-beam crane offers 3-way adjustment, up to 3 tons of capacity and added stability features for sure placement. Full beam or cantilever capable. I-beam self-centers over load even on sloped surfaces. Adjustable height, span and tread width. Solve problems of lifting heavy loads on building roofs, at the loading dock, or other external load situations. Adjustable legs and collapsible design for easy transport. Well suited for smooth or uneven floors with optional feet for soft earth. 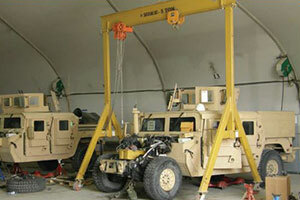 Great flexibility for maintenance, repair, and other temporary lift and load applications. 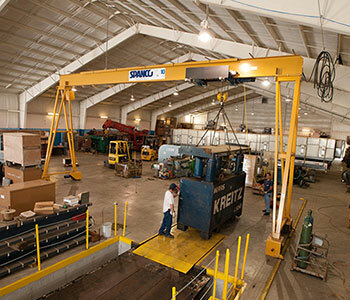 Gantry cranes offer lift and move capabilities that allow load transit from area to area within a facility. Their special structures support very heavy loads along the span of the top beam to facilitate a variety of applications, such as loading and unloading, fabrication and assembly, or maintenance and repair. All gantry cranes consist of three primary components: two leg structures and the I-beam span. Unlike jib cranes which only have one support point at the base or mast, gantry cranes have both leg structures to carry the weight of the load. Most gantry cranes are a basic A-frame shape with wheels on the leg structures. Some gantry cranes allow you to configure them with a cantilever style span for transferring the load to the end in order to do assembly work or to move the load off the crane. One of the greatest benefits of using gantry cranes is that the load can be walked to a new location simply by rolling the entire crane to the spot. Picking up a load is similarly easy; just walk the crane to the pick-up point. Gantry cranes don't require any permanent installation or secondary foundations, nor do they rely on building structural support to carry the weight of the load. These can be important considerations if you rent your facility or anticipate moving to a new facility in the future.